In time-domain synchronous (TDS)-orthogonal frequency division multiplexing (OFDM) systems, a pseudo noise (PN) sequence is inserted instead of the cyclic prefix. The PN sequence is used not only as a guard interval but also as a training sequence for channel estimation and synchronization in the time domain. Recently, research studies on 2 × 1 multi input-single output (MISO) TDS-OFDM systems have been conducted, and different PN sequences (which are orthogonal to one another or cyclically shifted) are transmitted at each transmit antenna for channel estimation, which are modulated by binary phase shift keying in the same phase angle. However, when the absolute phase difference among the transmitted PN sequences is π, a PN sequence cancellation problem occurs, making the estimation of an accurate carrier frequency offset (CFO) difficult. In this paper, a CFO estimation method with the aid of PN sequences for 2 × 1 MISO TDS-OFDM systems is proposed. In the proposed method, the phase of the PN sequences at each antenna is rotated differently and transmitted to prevent a PN sequence-canceling problem. In addition, a CFO estimation scheme using channel state information is proposed to estimate an accurate CFO in time-varying channels. We show by computer simulations that the mean square error performance of the proposed method over an additive white Gaussian noise environment and time-varying Rayleigh channel is higher than that of the conventional method. 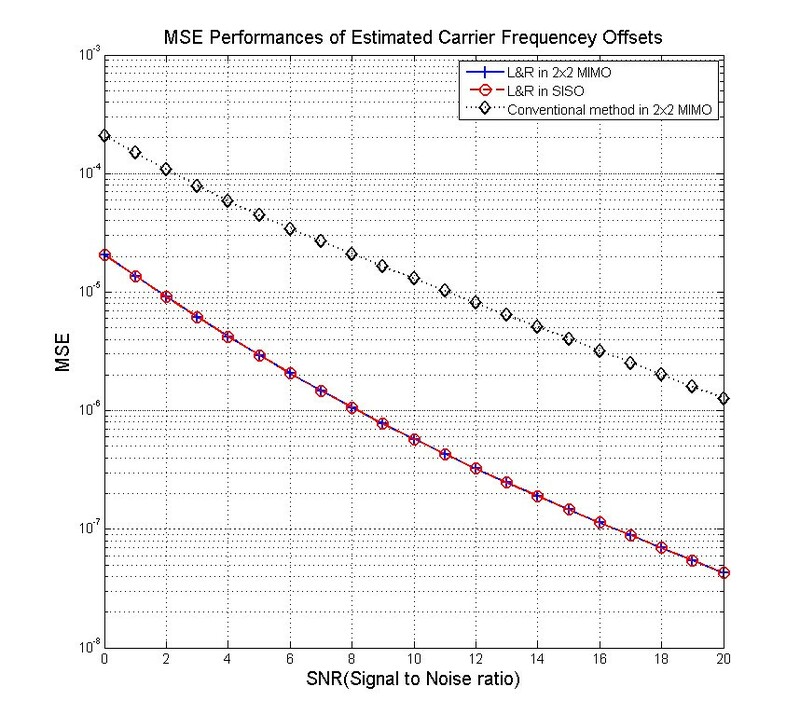 Orthogonal frequency division multiplexing (OFDM) systems  are popular broadband communication systems and have been well known to be effective against multipath distortion. 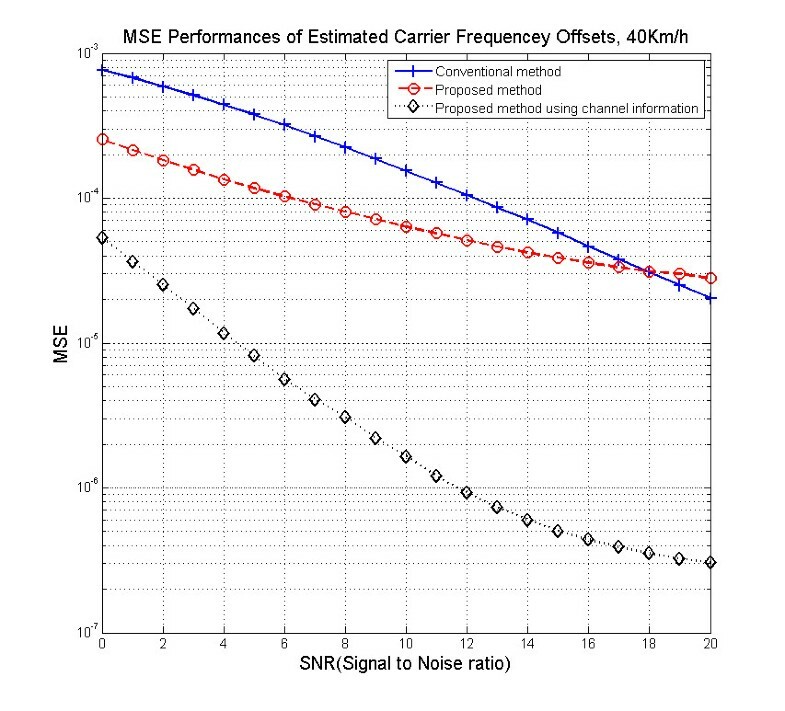 In general OFDM systems, cyclic prefix (CP) is inserted as a guard interval to efficiently combat multipath channel, and a pilot signal is inserted into the subcarriers for channel estimation and carrier recovery. In time-domain synchronous (TDS)-OFDM systems, a pseudo noise (PN) sequence is employed instead of the CP, which is modulated by binary phase shift keying (BPSK) . The PN sequence is used not only as a guard interval but also as a training sequence for channel estimation and synchronization in the time domain . Thus, it is not needed in the transmission of the pilot signal among subcarriers, and the spectral efficiency of the TDS-OFDM systems is higher than that of the CP-OFDM systems. Currently, digital TV broadcasting services in China employ TDS-OFDM systems . Recently, research on the transmit diversity scheme of the TDS-OFDM systems has been conducted in [5–7], and it mainly focused on the 2 × 1 multi input-single output (MISO) systems to achieve diversity gain. The Alamouti code  is a well-known transmission method for 2 × 1 MISO systems and can achieve good spatial diversity gain with minimal decoding complexity. Thus, 2 × 1 MISO TDS-OFDM systems are promising and reliable systems to achieve better performance. In these systems, different PN sequences (which are orthogonal to one another or cyclically shifted) are transmitted at each transmit antenna for channel estimation, which are modulated by BPSK in the same phase angle. However, when the absolute phase difference among the transmitted PN sequences (which are transmitted in the same phase angle) is π, a PN sequence cancellation problem occurs and makes the estimation of an accurate carrier frequency offset (CFO) difficult. In this paper, a CFO estimation method with the aid of PN sequences for 2 × 1 MISO TDS-OFDM systems is proposed. 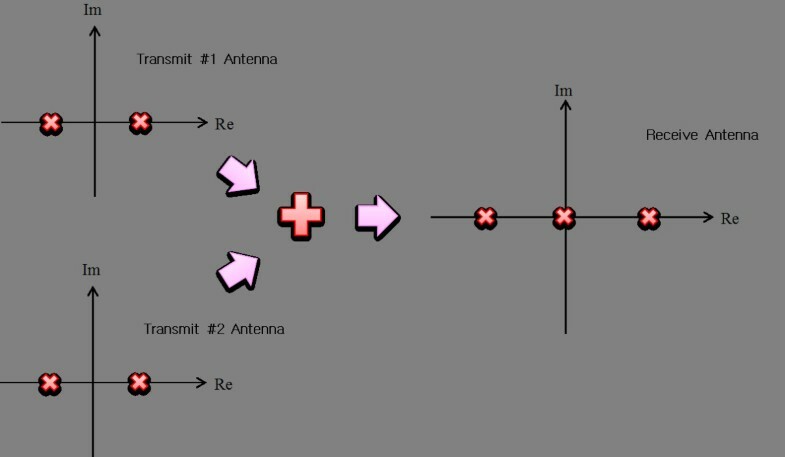 In the proposed method, the phases of the PN sequences at each antenna are rotated differently and transmitted to prevent the PN sequence canceling problem. After the modulations of the received PN sequences are removed, the CFO is estimated using the L&R algorithm , which is a type of a maximum likelihood (ML) method with several numbers of auto-correlators. In addition, a CFO estimation scheme using channel state information (CSI) is proposed to estimate an accurate CFO in time-varying channels. Using computer simulations, the mean square error (MSE) performance is measured by employing the proposed transmission method and the L&R algorithm over an additive white Gaussian noise (AWGN) environment and a time-varying Rayleigh channel. The rest of this paper is organized as follows: in Section 2, the PN cancellation problem is analyzed when the transmitted PN sequences have the same phase angle, and the CFO estimation method is introduced even under the presence of the PN cancellation problem; in Section 3, the CFO estimation method and a scheme that uses the CSI are proposed; the computer simulation results of the MSE performance are presented in Section 4; and conclusions are drawn in Section 5. Let us consider a 2 × 1 MISO TDS-OFDM system with two transmit antennas, one receive antenna and N data subcarriers. The frame structure consists of the N PN (long PN sequence as the guard interval) and N subcarriers, as shown in Figure 1[2, 3]. At each transmit antenna, the PN sequences, which are orthogonal to one another or cyclically shifted, are transmitted by BPSK modulation in the same phase angle for MISO channel estimation [5–7]. We assume that the Doppler shifts between all transmit-receive antenna pairs are approximately the same . Frame structure of TDS-OFDM systems. 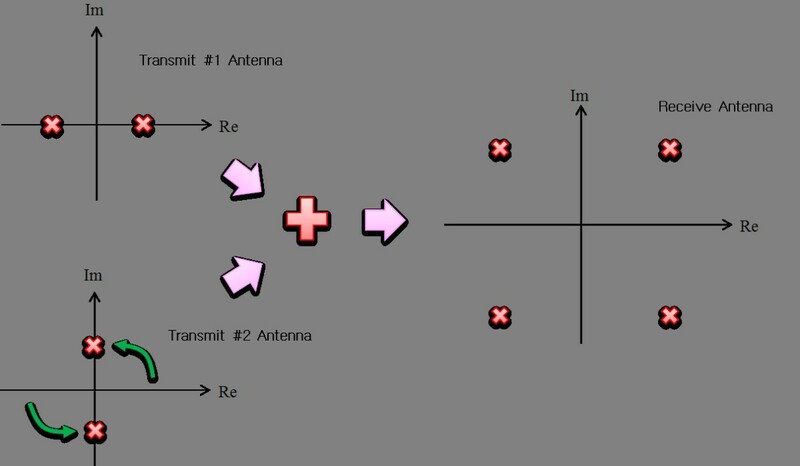 where PN1(k) and PN2(k) are the transmitted PN sequences from the first and second transmit antennas, respectively, ƒ c is the CFO, T s is the sampling period, θ is an unknown phase offset, and n(k) is the AWGN at the receive antenna. Received PN sequence when transmit PN sequences have the same phase. Whereas PN Tx (k) is constant when PN1(k) and PN2(k) have the same phase, as expressed in (2a) and (2b), the PN sequence cancellation problem occurs and PN Tx (k) is equal to zero when the absolute phase difference between PN1(k) and PN2(k) is π, as expressed in (2c). To estimate the CFO, the modulation is first removed by multiplying the complex conjugate of the locally generated PN Tx (k) to receive the k th PN sequence yPN,1(k). n ' k = n k P N Tx * k .
where n ' ' = e j 2 π f c k T s + θ n ' k − 1 + e − j 2 π f c k − 1 T s + θ n ' k + n ' k n ' k − 1 and n' ' ' = arg[n' ']. When (3a) exists continuously (meaning that (2a) and (2b2b) exist continuously), the CFO can be normally estimated. These examples are shown in Figure 3. CFO estimation method using transmitted PN sequences that have the same phase. (a,d) Normal CFO estimation condition. (b,d) Impossible CFO estimation condition. Only when (2a) and (2b) exist continuously, as shown in Figure 3a,d, can the CFO be estimated normally. However, when (2c) exists, as shown in Figure 3b,c, the phase difference between successive PN symbols cannot be used for the CFO estimation. Therefore, all the PN symbols may not be used for the CFO estimation, and the CFO cannot be estimated accurately using more than one auto-correlators, similar to that in the data-aided (DA)-ML methods [9, 11, 12]. where Narg is the number of arg[z(k)z*(k − 1)] calculations. In this section, the CFO estimation method is proposed, which rotates each phase of the transmitted PN sequences and employs the L& R method in Section 3.1. Furthermore, a CFO estimation scheme that uses the CSI is proposed in Section 3.2 for accurate estimation in the Rayleigh channel. In this section, a transmission method that rotates each phase of the transmitted PN sequences to prevent the PN sequence cancellation problem is proposed. In addition, a CFO estimation method employing the L&R algorithm  is proposed. Proposed PN sequence transmission method using phase rotation. When the phase of the transmitted PN sequences is rotated by the proposed method, the PN Tx (k) sequences for all cases can be used for the CFO estimation, as shown in Figure 5a. In addition, more than one auto-correlators can be used for the CFO estimation, similar to the ML methods [9, 11, 12], because all consecutive PN Tx (k) sequences can be used, as shown in Figure 5b. Therefore, the accuracy of the estimated CFO can be increased as compared with that of the conventional method. Frequency offset estimation with PN sequences employing proposed phase rotation technique. (a) CFO estimation with a single auto-correlator. (b) CFO estimation with multiple auto-correlators. The frequency offset estimation method is explained as follows: the modulation is removed by multiplying the complex conjugate of the locally generated PN Tx (k) to receive y PN (k). where n ′ k = n k P N Tx * k .
After removing the modulation of the received y PN (k), the phase difference is calculated from the argument of the multiplication between zPN(k) and Z PN * K − 1 .
where n ″ = e j 2 π f e kT + θ n ′ k − 1 + e − j 2 π f e k − 1 T 2 + θ n ′ k + n ′ k n k − 1 and n‴ = arg[n″]. where N R is the number of auto-correlators. The accuracy of the estimated CFO increases while the CFO estimation range decreases as N R increases . In addition, as N R increases, the number of R(m) in Figure 6 increases, and the hardware complexity increases. L& R CFO estimation algorithm. Figure 7 shows the normalized CFO estimation range of the proposed method, and the N R value of the L&R method is equal to eight. When N R is set to eight, the normalized CFO estimation range is from −0.11 to +0.11, as shown in Figure 7. This estimation range is sufficient in general terrestrial digital TV broadcasting environment . If a wider estimation range is required, N R can be decreased or the M&M method , which shows an almost full estimation range, can be employed. Normalized frequency offset estimation range of proposed method. where h11 is the channel impulse response (CIR) from the first transmit antenna to the receive antenna and h12 is the CIR from the second transmit antenna to the receive antenna. In the Rayleigh channel, h11 and h12 are time varying, and the variation rate depends on the Doppler frequency. The proposed PN sequence transmission method rotates the phase of the PN sequences to prevent the PN sequence cancellation problem. However, when the absolute phase difference between the time-varying h11 and h12 is π/2, the PN sequence cancellation problem occurs again, and the accuracy of the estimated CFO decreases in contrast to that in the AWGN channel. In other words, as the absolute phase difference between h11 and h12 tends closer to π/2, the accuracy of the estimated CFO decreases; when it becomes smaller than π/2, the accuracy increases. 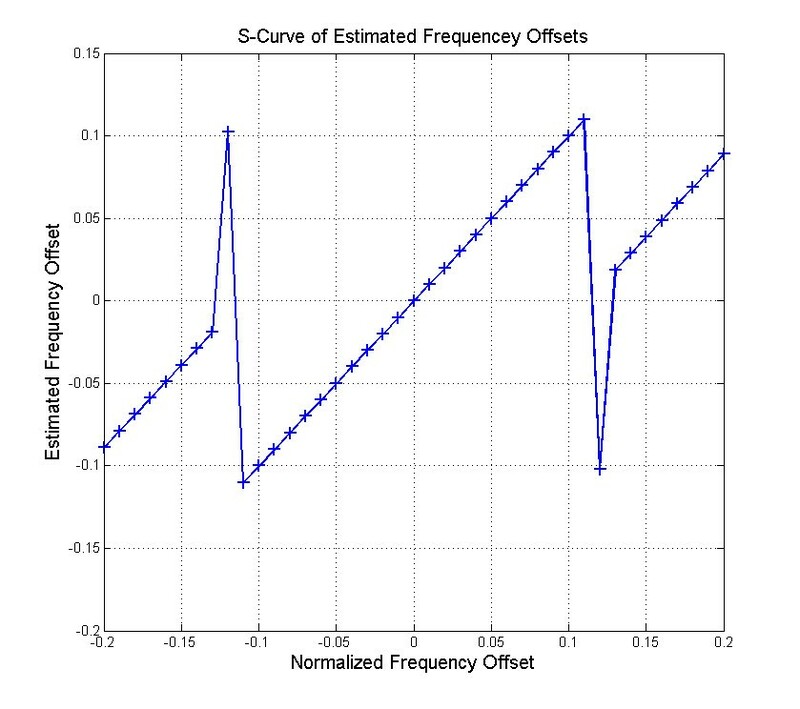 Thus, the frequency offset estimation scheme using CSI is proposed, as shown in Figure 8. 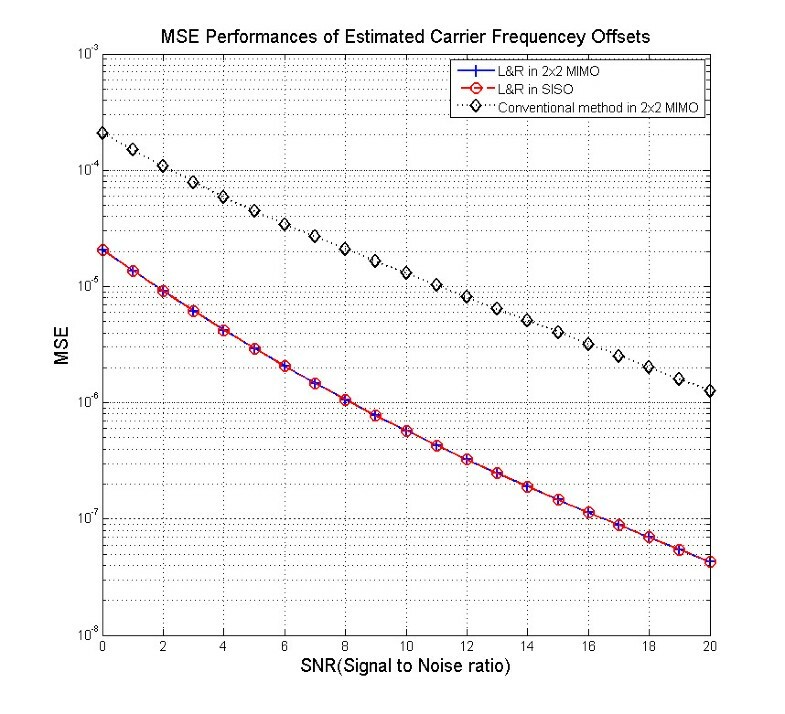 Proposed carrier frequency offset estimation scheme using CSI. The proposed scheme consists of the coarse carrier frequency recovery (CFR), which is a feedback structure, fine CFR, which is a feedforward structure, and phase calculator that uses CSI. For the estimation scheme, the proposed PN sequence rotation and the CFO estimation method are employed for the coarse CFR, and the pilot block correlation method in  can be employed for the fine CFO estimation algorithm. In the proposed scheme, the fine CFR estimates the CFO and applies it to the compensator using the PN sequence at every frame. On the other hand, the coarse CFR first estimates the CFO at every frame and applies it to the compensator using the CSI. The phase estimator estimates the CSI using PN sequences over one PN block (guard interval) after the CFR and applies the estimated CFO to the phase locked loop (PLL) only when the absolute phase difference between h11 and h12 is smaller than π/4. If the absolute phase difference between h11 and h12 is greater than π/4, zero is applied to the PLL. However, the CSI may not be acquired until CFR is roughly achieved. Thus, the proposed scheme controls the PLL using the CSI only when a rough CFR is achieved. Figure 9 shows the PLL output of a coarse CFR. CSI is not used for the CFR when the variance in the PLL output is smaller than 10−4 or 100,000 frames are used for the CFR (dotted line). 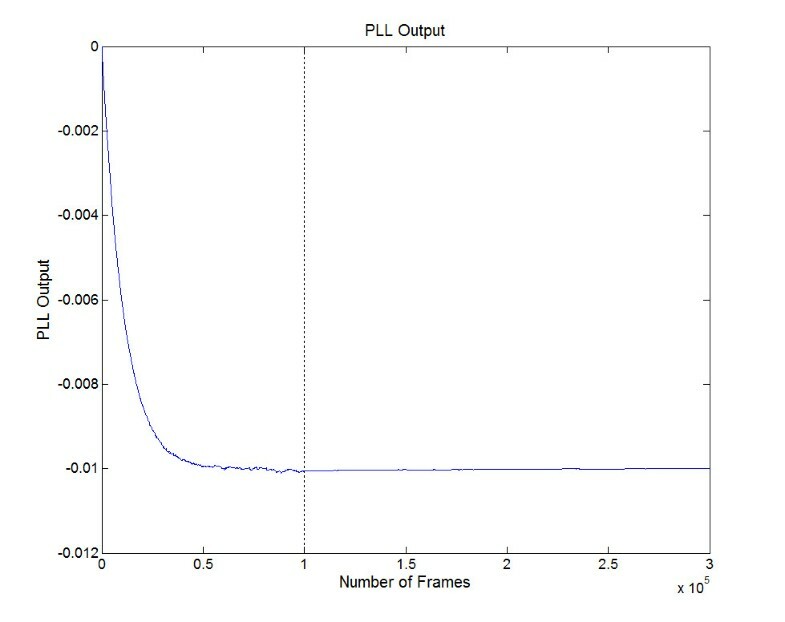 After 100,000 frames are used, the CSI is used for the phase difference calculation. In Figure 9, the PLL converges roughly without using the CSI, and rough CFR can be achieved without using the CSI. In addition, a fine CFO can be recovered after a coarse CFR; we can therefore decide whether to apply an estimated CFO to the PLL with the aid of the CSI after the PLL has roughly converged. PLL output of coarse CFR using the CSI. The PN cancellation problem in the conventional method can also be solved by employing the proposed frequency estimation scheme. For the conventional system, if the absolute phase difference between h11 and h12 over one block is greater than π/4, the CFO is estimated by employing several auto-correlators and applying them to the PLL. However, the proposed PN sequence transmission method that uses the proposed scheme is suitable for both the AWGN and time-varying Rayleigh channels, whereas the conventional method that uses the proposed scheme only works well in the time-varying channel. The MSE performance is measured by applying the proposed PN transmission method and the L&R algorithm over the AWGN and Rayleigh channels. Ideal symbol timing recovery and frame detection situations are assumed, and the simulation parameters are listed in Table 1. The symbol rate and the center frequency of the Korean DTV environment are used, and the CFO is set to 1% of the symbol rate . We assume that the distance between the transmitter and the receiver is sufficiently long, and the reception times from each transmit antenna to the receive antenna are the same . Figure 10 shows the MSE performance over the AWGN environment; the MSE performance of the proposed method is higher than that of the conventional method. The MSE performance over the Rayleigh channel by varying the receiver’s velocity from 40 to 120 km/h is shown in Figures 11, 12 and 13. We assume that the CSI is perfectly estimated. In contrast to the performance over the AWGN environment, the more the signal-to-noise ratio becomes higher, the more the MSE of the conventional method becomes smaller as compared with that of the proposed method. Because some of the CFOs are estimated by employing the proposed PN transmission method when the phase difference between h11 and h12 is closer to π/2, the accuracy of the estimated CFOs is lower than that of the conventional method. However, the MSE performance is much higher than that of the conventional method when the proposed transmission method and scheme using CSI are employed. In addition, the performance, which depends on the receiver’s velocity, is almost the same and shows only a slight difference. Because the CFO is estimated using the phase difference of the consecutive PN sequences for short duration or seven delayed PN sequences for maximum duration, the channel variation over the PN sequences is not very high. 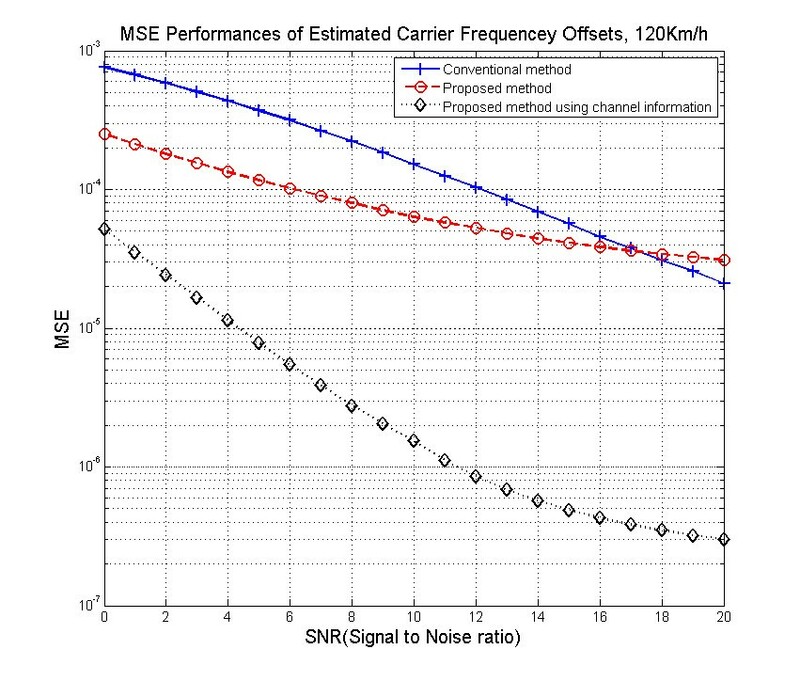 MSE performance over Rayleigh channel when the receiver’s velocity is 40 km/h. MSE performance over Rayleigh channel when the receiver’s velocity is 80 km/h. MSE performance over Rayleigh channel when the receiver’s velocity is 120 km/h. In this paper, we have proposed a PN sequence phase rotation transmission method and a frequency estimation scheme using CSI. The proposed PN transmission method rotated the transmitted PN sequences differently from one another to prevent the PN sequence cancellation problem and made possible the use of all consecutive PN sequences for the CFO estimation. 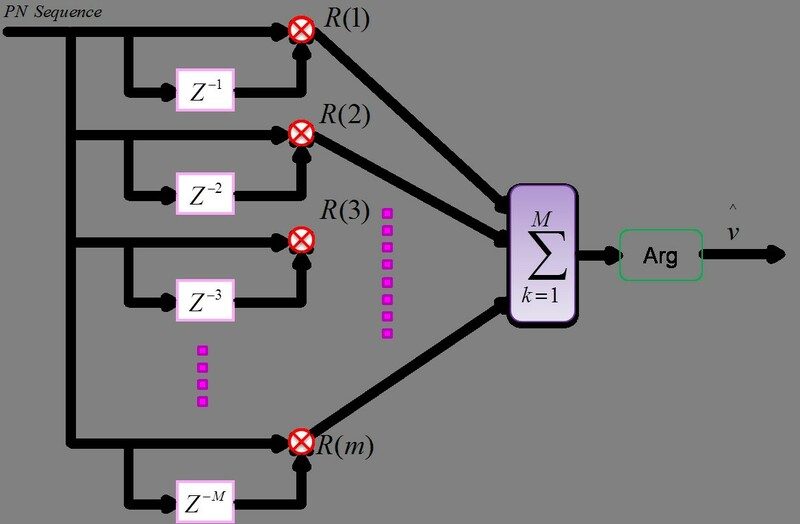 In addition, the CFO was accurately estimated by the L&R algorithm, which is a type of DA-ML algorithm with multiple auto-correlators. For the time-varying Rayleigh channel, the frequency estimation scheme using the CSI has also been proposed. The simulation results show that the MSE performance of the proposed transmission method and estimation scheme over the AWGN and Rayleigh channels is higher than that of the conventional method. This paper was supported by Konkuk University in 2010. The work presented here was carried out in collaboration with all the authors. JGO, JH and JTK defined the research theme. JGO designed methods and experiments, carried out the laboratory experiments, analyzed the data, interpreted the results and wrote the paper. JH and JTK co-designed the dispersal and colonization experiments and co-worked on associated data collection and their interpretation. JGO and JTK co-designed experiments, discussed analyses, interpretation and presentation. All authors read and approved the final manuscript.